NO TEARS WITH THIS GEORGIE! All Slots Casino :: Rhyming Reels-Georgie Porgie video slot - PLAY NOW! October 09, 2013 (Press release) – The proof is in the pudding in ALL SLOTS CASINO’s new Rhyming Reels slot. An old English nursery rhyme provides the theme for the newest 5 reel, 15 pay-line video slot to debut at ALL SLOTS CASINO this week, but unlike the female reaction to the leading character, this is one game that will make players smile, rather than cry. The rhyme has a rather unattractive school dweeb kissing the girls whilst they are distracted by a tasty pudding, making them weep… but when the hefty jocks from the football team come out to play, we all know what happened… our overweight and sly kisser ran away! All of these characters appear in modern form in the new slot GEORGIE PORGIE, the theme supported by outstanding and comical artwork, backed by a slew of features that includes a Gamble opportunity, Wilds, Scatters, Free Spins and seriously big Multipliers. Georgie is appropriately Wild-five of these symbols substituting across the reels delivering substantial pays to the player, along with a 5x bet Multiplier. In addition, during Free Spins, Wild wins are multiplied by 25x because of the 5x Free Spin multiplier. The Fresh Mints symbol has the Scatter role, awarding Free Spins with a 5x multiplier on a sliding scale of 15, 20 or 25 depending on how many land across the reels. But the winning doesn’t end there – if the mint symbol again comes up in Free Spins, an extra spin is awarded carrying a 2x multiplier. The popular Gamble feature has been made available in the game, enabling the player to lose, double or quadruple winnings by predicting the colour or suit of a card. 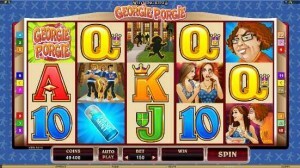 GEORGIE PORGIE is part of the amusing Rhyming Reels series of top quality video slots and provides players with great and varied entertainment and the chance of real rewards.